You don’t have to start high-tech. To continue along this line, today I want to talk a little bit about how I used all three of these tips to make a breakthrough for one of my students. I’ve been doing group therapy with students who are working on functional communication for the past nine years. I don’t know about you, but I get really discouraged when my students don’t make progress. However, I think I was setting the bar too high too soon. Of course I want them to be able to communicate their wants and needs. There are just so many little steps to getting there; it can take a really long time! This year I started using The Dynamic Learning Map Core Vocabulary; a list of 40 words that have been proven to be most effective socially and academically for students with significant cognitive disabilities. Developed at the Center for Literacy and Disability Studies at The University of North Carolina at Chapel Hill, these 40 words are based on AAC research. This is both low tech and resourceful. Plus I really didn’t know everything about it, but I did do my research and know that it’s backed by evidence. I made a core vocabulary board for my room and decided to see what happened. Let me tell you a little story to illustrate my point. I’ve been working with a little guy, let’s say his name is Benjamin (it’s not) for the last four years. Benjamin came to our school as a kindergartener with a diagnosis of Autism. He was nonverbal. His IEP from preschool had a following one step directions goal and an expressive language goal to “communicate his wants and needs using total communication”. For the first two years, Benjamin had to learn to follow classroom routines and follow directions. His sensory integration needs were high and we were trying to figure out how to meet them. I felt like a total failure as an SLP. He didn’t say words, he didn’t use signs, and he didn’t have joint attention. He stayed in his own little world. But, he did learn to follow simple directions with visual and verbal prompts. We have a little farm at our school and Benjamin was really interested in the animals. It was motivating and calming to him to be able to watch them. Soon he started labeling them. His parents bought him little plastic animals and taught him the names of over 100 animals. Progress, sort of. He still didn’t greet, comment, request or command. There was no joint engagement or joint attention. No pointing. He was just naming the animals for his own benefit. Not looking to see if we were listening, not wanting to share his discovery. If he couldn’t physically go get what he wanted, he would guide an adult’s hand to the item. Benjamin demonstrated echolalia and a lot of screaming. Then we he was in second grade we taught him to request by labeling. We used beads, which he loves to roll and toy animals, which he loved to line up. I was able to get some eye contact by holding the item he wanted by my eyes. He had to look at me and say what he wanted. After a while, we (me, the paraprofessionals, the teacher and his parents) got him to add “I want” but he needed a verbal prompt each time. Benjamin got an iPad with TouchChat that he was able to use but he hasn’t been too interested in it. This past school year, he changed classrooms and it took a good four months for him to settle into the new routine. His communication progress was at a standstill. Actually, he even regressed. I was so sad. I had just told his mom that I wasn’t making any progress with him in group therapy sessions. He was falling asleep, or hanging off of his chair or screaming; sometimes all three in one session. The other kids were so distracted. I made arrangements to see him for individual therapy for a while. The next day, Benjamin’s teacher forget to tell the aides about the new schedule and they brought him to my room with the group. I said, okay let’s just try one more time. 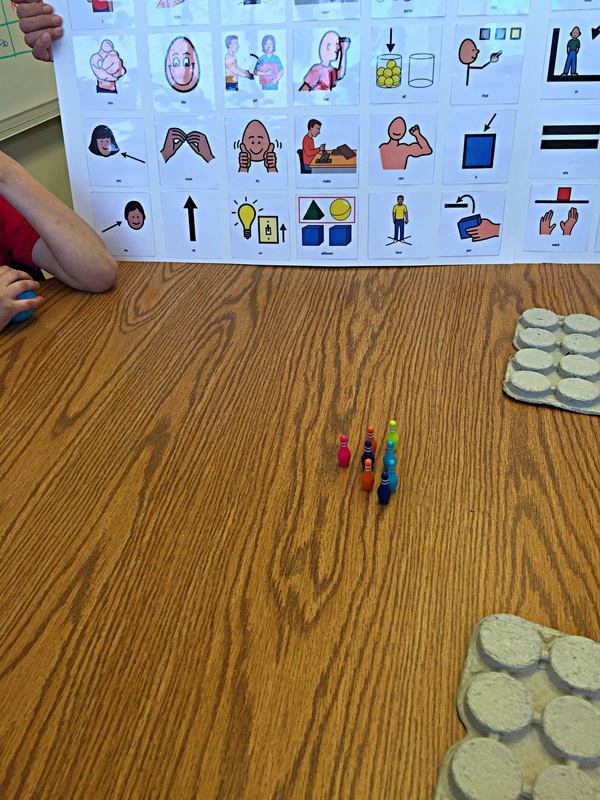 I was introducing the new core vocabulary board I made and planned to teach the command “go’ through the use of the picture symbol. I set up a little miniature bowling game on the table. I noticed I had Benjamin’s attention, so I let him go first. Big Therapy Win! He participated with minimal prompts for the first time ever. He loved the Core Vocabulary Board with the bowling. In this picture, he’s waiting, holding the ball until we (his classmates and I) say “go”. We had joint attention, joint engagement with PEERS, and smiling. I wish I would’ve filmed it. That was in January. Ever since then, he’s been participating. I keep the sessions really active with pop-up toys, wind-up toys and balls. So far he’s learned “go”, “stop”, “want”, “more”, and “I”. In April, he was able to put together this sentence “I want more go” using the picture cards and verbalizing. So exciting! What is it that worked? 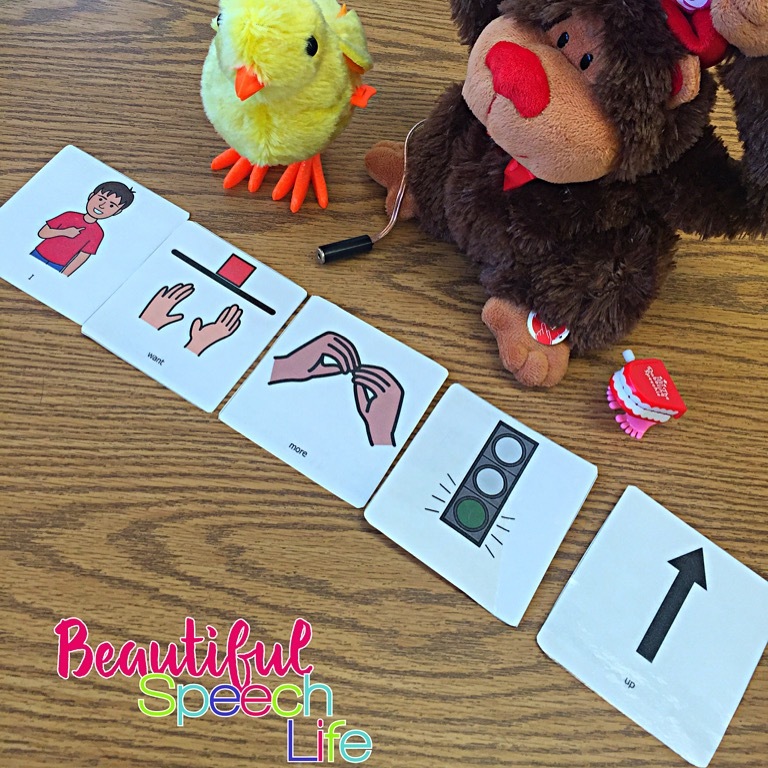 I believe it was a combination of timing, high interest activity and the Core Vocabulary visuals. I am really looking forward to seeing what is the next step for my friend Benjamin. So my point is…Patience Grasshopper. We have to keep trying new approaches. I knew Benjamin was really visual and had tried some pictures before with little success. 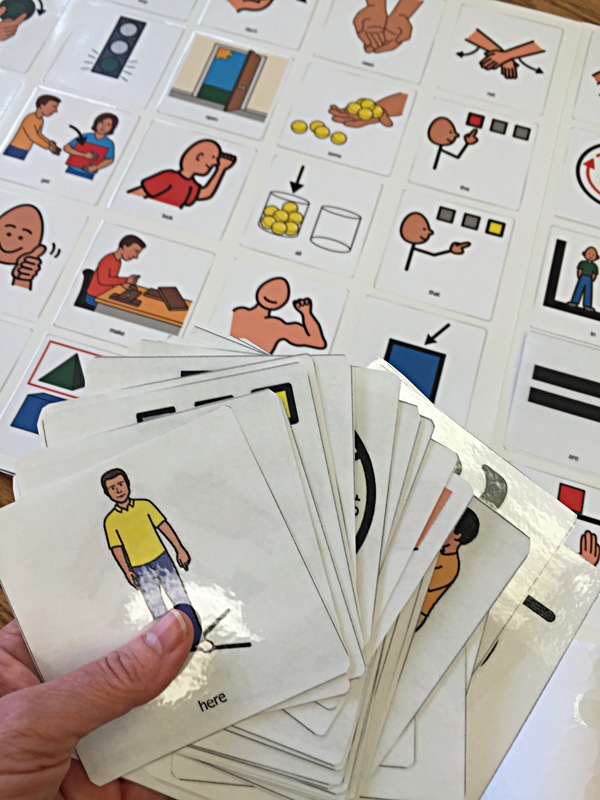 The Core Vocabulary words are immediately applicable and they can be used for fun, functional communication. I really encourage you to try using DLM Core Vocabulary Words. As I learn more about this, I will definitely share the information with you all. I made a little cheat sheet and resource guide for you to help you get started. I know it can be a little overwhelming when you start out, so I streamlined it for you. Click on the green box to get your FREE copy. Where did you get your Core pictures? I love how you made them large!! I made it Kerry. I’m working on one for my TPT store right now. I’ll keep you posted.